Since 1988, the founders of Valogix have been leading innovation in advanced inventory planning, optimisation, and predictive analytics solutions. The advanced technology solutions automatically forecast demand, set and optimise stocking levels and replenishment stock, and optimise the investment in inventory. Our goal is to provide our customers with excellent solutions and services designed to achieve their desired results. The Valogix Team offers various services from implementation, to Initial and follow-on training, business and supply chain consulting, interface development and more. VALOGIX Support Services are provided to both customers and partners as part of their annual maintenance contract. These services assist in solving issues you may encounter and also provides upgrades and patches for installed Valogix solutions. 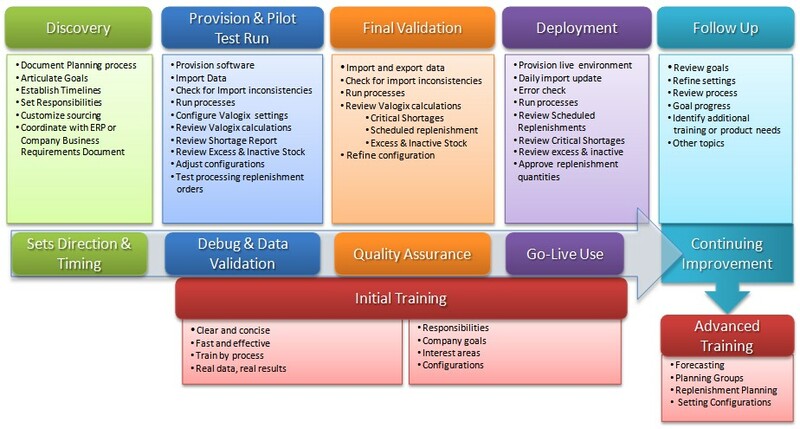 VALOGIX Training Services are designed to help in effectively using VALOGIX Inventory Planner. From the start you will experience first hand the ease of use and the benefits of an automated planning solution. After initial training, follow-on training provides tips and tricks to help improve your planning and results. VALOGIX Consulting Services are a process and unique set of tools that diagnose your current situation. We can help define the right project for you in the pursuit of better supply chain management. The impact can be quite substantial for enhancing inventory management, productivity, and inventory strategy development. VALOGIX Consulting Services will help you review the results and build a manageable roadmap that works for you. Combined, Valogix specialists have over 150 years of experience covering many industries and company of all sizes. VALOGIX Inventory Planner is accessed in The Cloud at a Valogix partner data center. A subscription Service license (SaaS) is provided. VALOGIX Inventory Planner is Hosted at a Valogix partner data hosting center. A perpetual license with annual maintenance fees is provided. VALOGIX Inventory Planner is Installed at your facility (On-Site) A perpetual license with annual maintenance fees is provided.